1) Internal design of the Vortex Water Revitalizer and how it works. I am Mikael Lund, the owner of World Living Water Systems Ltd. First of all I can share the good news that our website is now on a really fast server, so the pages are loading fast and immediately. Now you can enjoy exploring www.alivewater.com with ease and with speed. The website is growing with new material and functionality as times goes bye. Ordering is made easier and it is NOT necessary to have a PayPal account. You can use your credit card without having a paypal account.....And now to the good stuff. How does the Vortex Water Revitalizer work? Many people have asked me over the years how the Vortex Water Revitalizer is working. I have explained how water in Nature is always flowing in spiraling movements in order to keep itself healthy and full of vitality. You have seen this yourself, I am sure, while spending time in nature observing rivers, streams and oceans. Water in its healthy and natural state, has self-cleaning and antibacterial properties; but only to a point of course. Too much abuse and exposure to unnatural conditions and the water will loose its natural properties. Municipal water treatment and distribution systems put water through many unnatural processes causing it to become de-structured and lose its natural health and vitality. The same goes for conventional water filters, which is why I designed models to be installed after filters. See website for more details. The Vortex Water Revitalizer's internal double spiral flow form, simulates the natural movement of water in nature. When the water flows into the Vortex Water Revitalizer it is being split into two parallel streams and the water itself is forming a fast moving double helix (DNA type) spiraling dance producing a multitude of tiny little vortices causing implosion in the water. The flow form is a cycloid, curved space, spiraling motion device that I named the Vortex Water Revitalizer. I designed it in 2003 in its standard straight format and in 2008 I designed the River of Life models. My main inspiration was and is Viktor Schauberger. Gardens, houseplants, fruit, vegetables and lawns will thrivLise Hamilton 3e with the use of the Vortex Water Revitalizer. Soil will improve and become more capable of supporting plant growth. In addition, the soil will become more efficient in delivering nutrients to your plants, and plants will become more capable of absorbing nutrients from the soil. Soil will also become more capable of holding humidity (water). After about 1-3 months, the amount of water needed for irrigation will gradually reduce 20%-50%. This is especially important for those in areas susceptible to draught and/or water restrictions. The stems of plants will become stronger and thicker, flowers and leaves will also become larger. The quality and quantity of flowers, fruits and vegetables will greatly improve and stay fresher for longer. Trees have responded to Revitalized Water by growing faster and stronger. Testimonial: You can find many more testimonials on the Testimonial section of our website. This testimonial is in two parts. First one in 2008 and the second one in 2012. I just wanted to give you some initial feedback on the Whole House Vortex Water Revitalizer, that we installed at our well several months ago, in early Spring 2008. In addition to installing the VWR [Vortex Water Revitalizer], we also installed a drip system around our acre of property, which has been populated with literally several hundred of trees, bushes, vines, planted and flowers. The results are absolutely remarkable! We've been on the property for 4 years. We started planting almost immediately after we arrived. The earth was pretty barren at the time, although redwood stumps surrounded the property and dried weeds were in abundance. When we first started planting, it took a long time for newly planted things to get acclimated and to really start to grow. Since installing the VWR, however, things have taken off within a day or two of putting them in the ground! Rose bushes that were planted just a couple of months ago are producing beautifully large and fragrant flowers. 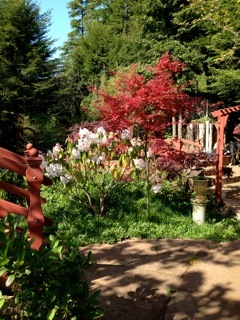 Rhododendrons that were planted this Spring have taken off with unbelievable growth. Bushes that we've had in the ground for 4 years bloomed flowers this year for the first time ever. 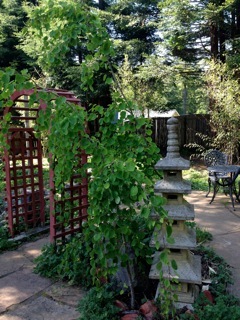 Our Tower of Jewels grew to over 15 feet this Spring. The leaves on many of our bushes and trees are larger this year than they've ever been. The trees are growing noticeably taller and thicker as if by the day. The number and variety of birds that we're seeing this summer has increased exponentially. And, the water tastes great! I am drinking more water than I ever have before and there is a vibrancy in the taste that surpasses the taste that I grew to love from my well water when I first moved here. I am delighted with the results of the VWR [Vortex Water Revitalizer] and a definite believer in its effectiveness. I am extremely grateful that you are making available the VWR [Vortex Water Revitalizer], which has the potential to contribute in such profound ways to the healing of living things on Planet Earth." I am no soil scientist. I am a fairly unorthodox corporate lawyer who works from home. HA! Here's what I can tell you about the transformation of this property since moving here in June of 2004. There are about twelve old growth redwoods that were cut down and in various stages of secondary growth. This soil has a reputation of being very acidic and inhospitable to many other things but ferns and a few other green plants that grow in the forest. Although I'm not growing flowers in the vicinity of the Redwoods on the property, I am growing several other ferns, bushes and plants that are thriving. Nothing was growing around that area when I first moved here. There were large portions of the land that were virtually impenetrable red clay. It didn't matter how much we watered pre-vortex [Vortex Water Revitalizer]. The water was not absorbed and growing was a challenge. Now, all of that dirt is dark brown, has a very healthy population of worms and is growing all manner of trees and bushes. The ground is lush, as is the vegetation. Winters here are mostly rainfall, so I turn off the drip system during the winter. However, because of the transformation of the earth since using the vortex [Vortex Water Revitalizer], many more things continue to grow in the winter rather than going into a dormant state like they used to in the early years. The first couple of summers before we installed the vortex [Vortex Water Revitalizer], we had to water every day for hours just to keep things alive. Now, during the spring and summer, when I turn the drip system back on, with the vortex [Vortex Water Revitalizer], each area gets far less water every other day for between 15 minutes and 1/2 hour at the most. I don't believe that any area that wasn't already dripped required additional watering for the last 3 summers at least - that's how effectively saturated the soil now is. Of course, having healthy trees and bushes helps tremendously, but even in the areas that have weeds, and they are plentiful because the property is way too planted to effectively weed...yet... the ground has been transformed in the manner described. The results are cumulative. Each year, the gardens have become more naturalized even though what is planted is far from being "native" to this area. I'm growing flowering fruit trees, rhododendrons, ornamental maples, hydrangea, roses, wisteria, large maples, an empress tree that each year flowers more and more and has grown into a huge tree in the 5 years that it's been in the ground, all kinds of bamboo -- even timber bamboo that started out about half the diameter of a dime and is now larger than the diameter of a half dollar, Aurelia, and many other specimens. The garden does not look like it's 5-7 year old. It looks like the specimens have been here for closer to 15-20 years, so say others. The water is delicious to drink and I've stayed healthy with only an occasional cold in an area that is renowned for taking many people down with the flu each winter. I walk in the garden each day and allow myself to take in the health and majesty of its inhabitants. It keeps me full of gratitude and appreciation for Nature and its healing powers. I am, indeed, very blessed, and I believe the vortex [Vortex Water Revitalizer] to be an integral part of what has evolved on this land. Wishing you much fortune and success. 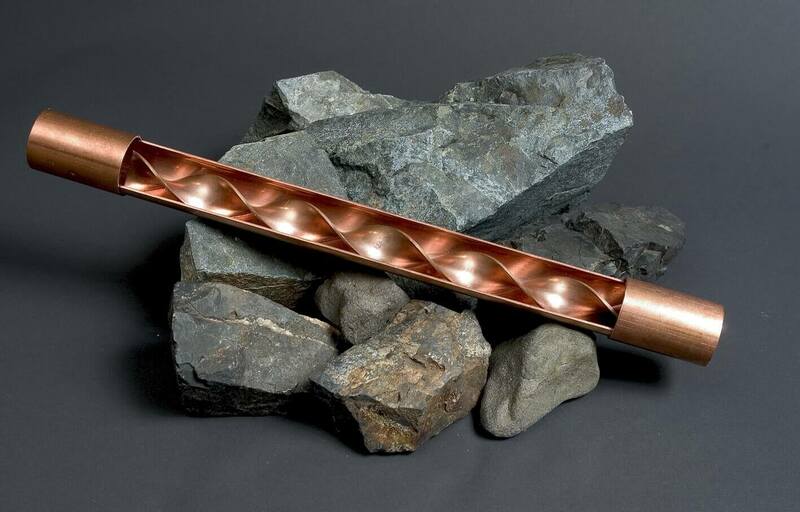 The vortex [Vortex Water Revitalizer], is most certainly part of the New Earth that so many of us, each in our own way, is striving to co-create and be a collective part of. In the first years after installing the Vortex Water Revitalizer, we continued to plant and things grew so much that although none of the plants really ever seemed to be without moisture, they had less and less room to grow and sufficient sunlight became a problem for many of the specimens under other trees and the like. I've had many things removed altogether, and other things moved to places where they would have better sun or room to grow and/or be better appreciated from an aesthetic perspective. I believe that within the next six months, if you can believe it has taken that long, the structure of the garden will finally be mostly done (as it is never really done), and we'll be able to focus more on maintenance and refining (weeding and the like). 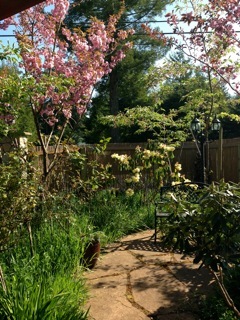 The garden presently is chaotic and messy but extraordinarily lush. The baron ground about which I described is no longer. The earth itself has been transformed into fertile ground, everywhere on the property! The trees that are still here, and there are many that remain, are magnificent! I decided that the most beautiful of the species that I wanted to focus on most were the ornamental maples, which by their nature, grow slowly; the flowering cherry trees, which have grown faster than any that I have seen elsewhere, and the rhododendrons, which as I shared with you when I first wrote to you, have bloomed sooner and more prolifically than what most in this area do. What I can say over the past two years of removing so many things to make room for what remained, and to create space around the species that remained so that you can actually see and appreciate their shapes, is that there have been very few specimens (I can actually count them on one hand) that have not survived the trans-plantings. I attribute this to the revitalizer as well as to the care of my gardener. I have spent hours and hours walking the gardens, dreaming of how to create the space so that it is at one and the same time full and empty, and I believe that in probably two year's time, the garden will be museum quality, that is, if I can finish the ponds and waterfalls that were dug out but never completed a few years ago. For those of you who read this far, I wish to thank you and am hoping that you will enjoy any future issues of Subtle News from World Living Water Systems. I hope that you find it is worthy of being shared with your family, friends and business contacts. President & CEO World Living Water Systems Ltd.
www.alivewater.com Email: mikael@alivewater.com T: 604-990-5462 | Toll Free: 888-644-7754 C: 604-727-9199 | F: 604-904-7455 432 Dollarton Hwy North North Vancouver, BC V7G 1N1, Canada .